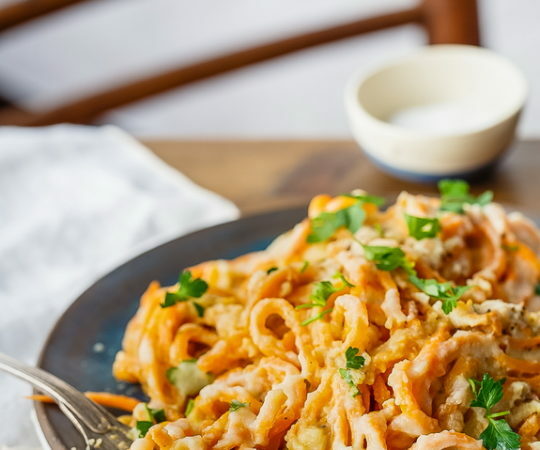 Just as tasty as the restaurant version, this recipe for Paleo Pad Thai will also provide you with a wealth of healthy nutrients. Zucchini noodles, used as the base, add a large serving of vegetables into your day, and the sauce is made of all natural ingredients. 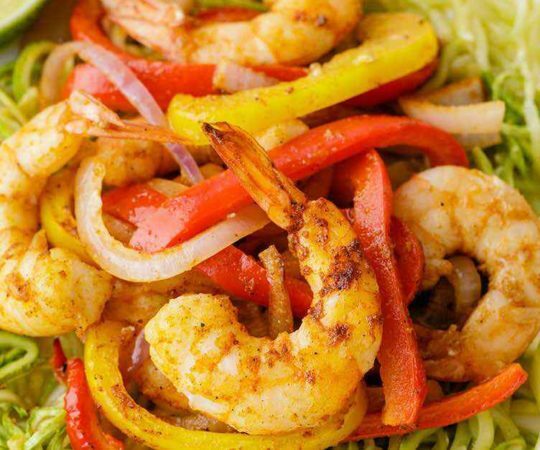 Serve the Pad Thai with chicken or shrimp to round out the meal with protein. 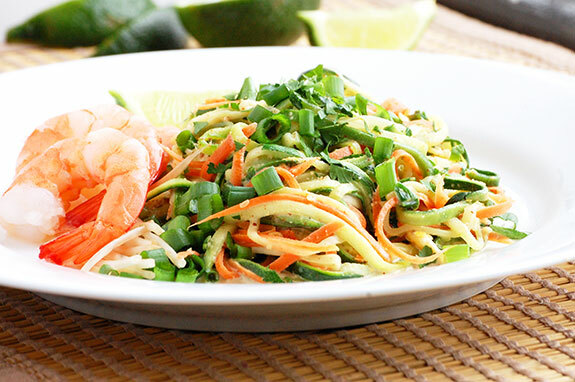 Zucchini is shredded into long noodles to replace the rice noodles used in traditional Pad Thai. 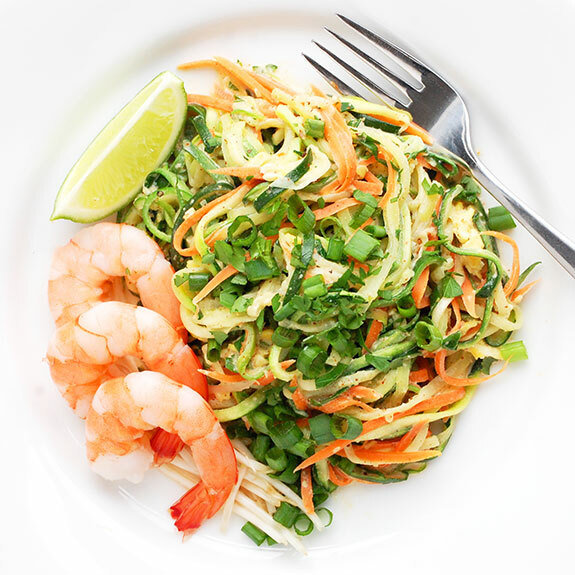 The zucchini noodles are also briefly cooked in this recipe, but can be eaten raw if you desire. 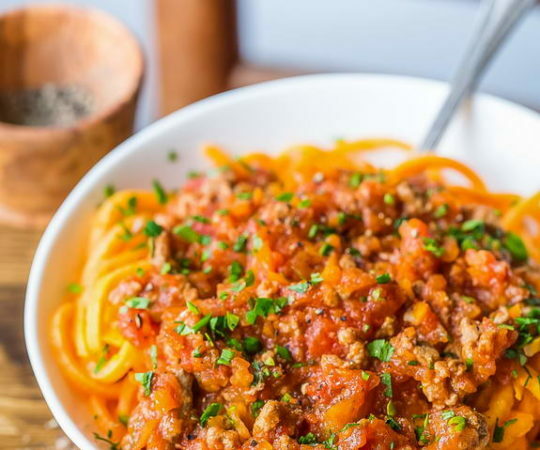 Spaghetti squash noodles would also work fine as the base of this dish. Almond butter, coconut milk, and the classic flavors of lime juice, garlic, and ginger are balanced into a delicious sauce. 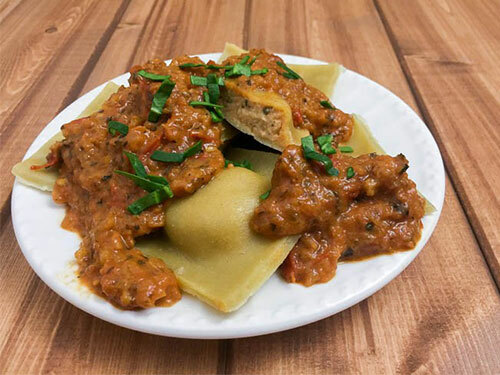 The sauce for this recipe is made in a food processor, and the ingredients are simply pureed together until smooth. You can adjust the level of each ingredient to your personal taste – more almond butter for extra nuttiness or coconut milk for sweetness. Or, stir in a dash of heat with cayenne or red pepper flakes. The sauce can be made ahead of time and refrigerated until ready to serve. The cooking time for the Pad Thai is minimal. Eggs need to be scrambled, and the zucchini noodles only need a brief turn in the pan. Shredded carrots, green onions, and cilantro are added at this step, and then the sauce is finally mixed in. 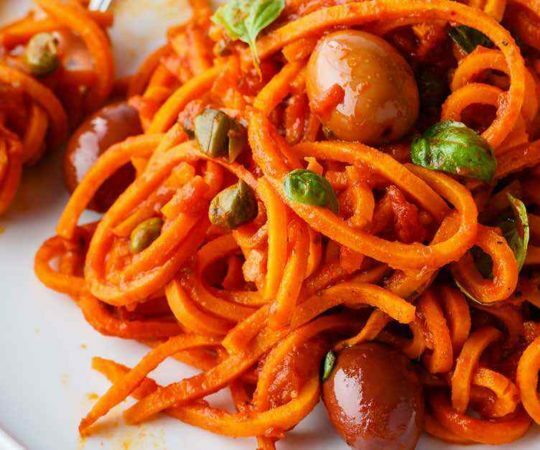 The toppings for this recipe are completely customizable. Instead of peanuts (which are not allowed on the Paleo diet since they are legumes) roasted cashews can be sprinkled on top for extra crunch. If you would like to include bean sprouts (typically from mung beans) they are relatively harmless but technically not Paleo. The choice is up to you; they are on the same level as green beans. Include a couple of lime wedges on the side to add the final touch before serving. 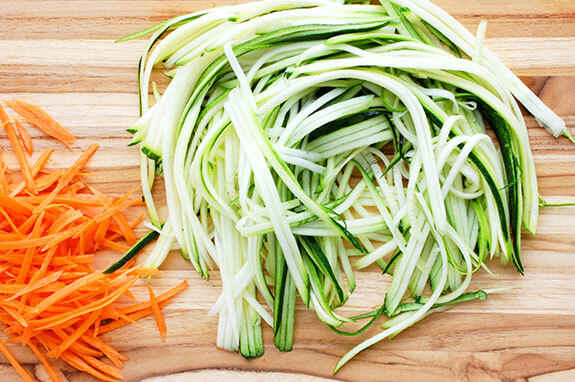 Use a julienne peeler to slice the zucchini into noodles, stopping when you reach the seeds. Set aside. 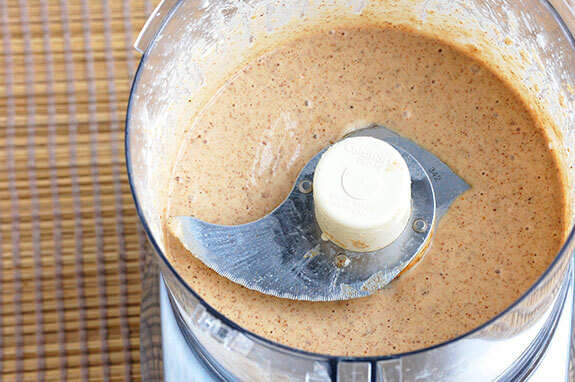 Add the sauce ingredients to a food processor and blend until completely combined. Adjust the levels of almond butter and coconut milk to reach desired level of creaminess. Heat the coconut oil in a large skillet over medium heat. Add the eggs and stir to scramble. Transfer to a plate once cooked. 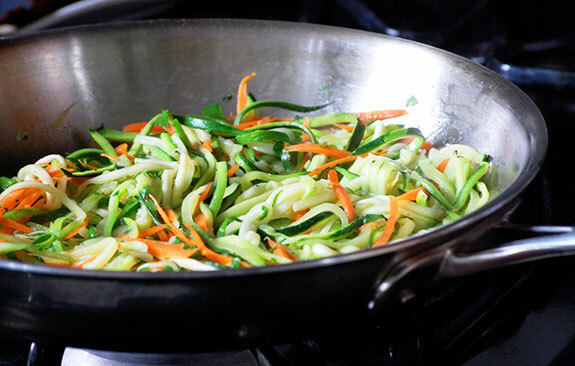 Add the zucchini noodles to the skillet and sauté over medium heat for 1-2 minutes. Stir in the carrots, green onions, and cilantro. Cook for 1-2 minutes more. Add the sauce to the pan and stir to coat. Top with roasted cashews and lime wedges on the side. 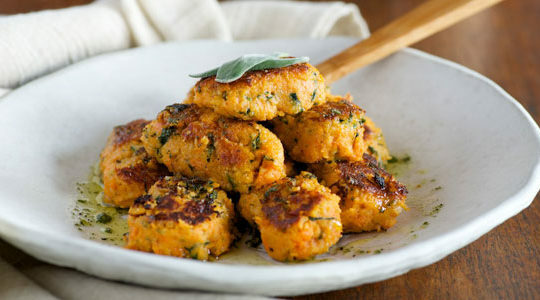 Serve with chicken or shrimp if desired.